Background: There is evidence that oxidative stress can be considered as a critical event in the development of atherosclerotic complications. In this study, we aimed to assay the values of prooxidant-antioxidant balance (PAB) in patients with coronary artery disease (CAD), as a cardiovascular risk factor, and its relationship with some clinical, biochemical, and anthropometric parameters was examined. Materials and Methods: In a case–control study, forty CAD patients and forty age and body mass index (BMI)-matched healthy controls hospitalized in the cardiology section of Imam Ali hospital of Zahedan, Iran, were enrolled. 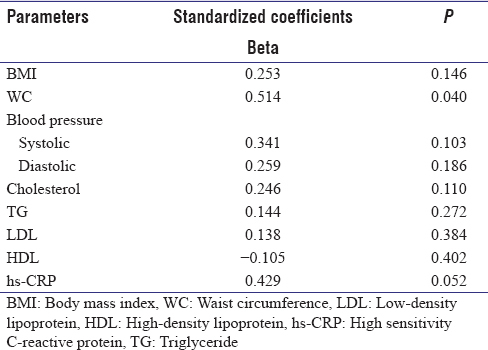 The levels of serum lipid profile, C-reactive protein (CRP), blood pressure, BMI, and waist circumference (WC) were evaluated. The values of PAB were also assayed simultaneously by photometric method, using 3, 3′, 5, 5′-tetramethylbenzidine and its cation, used as an indicator of redox. Results: PAB was found to be significantly higher in CAD patients (P < 0.05) as compared with control group. The obese patients had higher values than nonobese patients and controls (P < 0.05). In CAD patients, a significant positive correlation was demonstrated between WC (r = 0.56, P = 0.05), high-sensitivity-CRP (r = 0.65, P = 0.04), cholesterol (r = 0.36, P = 0.052), and triglyceride (r = 0.29, P = 0.055) with PAB. Conclusion: The study shows that the PAB assay in conjunction with other risk factors can be used as an independent prognostic predictor of CAD, particularly in patients who need antioxidant therapy. Oxidative stress is caused by an imbalance between the production of reactive oxygen species (ROS) as prooxidants and antioxidant defenses. Oxidative stress markers including reduced activity of superoxide dismutase and glutathione, increased levels of malondialdehyde, superoxide anion (O2−), and sulfhydryl groups can lead to proatherogenic events such as LDL oxidation and vascular smooth muscle cell proliferation., Recent data indicate that high values of adiposity, especially of the abdominal type, which has a strong association with increased risk of atherosclerosis, hypertension, and dyslipidemia  generate chronic low-grade chronic inflammation and increase conditions of oxidative stress. Both inflammation and oxidative stress in vascular and fat tissues contribute to the atherosclerotic process. The prooxidant-antioxidant balance (PAB) is evaluated by determination of both the oxidant and antioxidant status. The researchers have recently applied a method which measures the balance of oxidants and antioxidants simultaneously in one reaction (the PAB assay). In this study, PAB values in patients with CAD were compared with healthy controls, and its relationship with some cardiovascular risk factors such as serum levels of lipids and C-reactive protein (CRP), blood pressure, body mass index (BMI), and waist circumference (WC) was assessed. After 15 min of sitting, blood pressure was measured in all participants, by the mercury sphygmomanometer. BMI was calculated as weight (kg) divided by the square of the height (m2). WC was measured midway between the lower rib margin and the iliac crest at the end of a gentle expiration. WC >102 in men and WC >88 in women were considered as prognostic predictors of abdominal obesity. Peripheral venous blood was drawn from all participants after overnight fasting. Serum was separated, and aliquots were immediately frozen at −70°C until analysis. The levels of total cholesterol, triglyceride, HDL-C, LDL, creatine phosphokinase (CPK), lactate dehydrogenize (LDH), creatine kinase-muscle/brain (CK-MB), and aspartate transaminase (AST) were measured using standard kits (Pars Azmun, Tehran, Iran) using an autoanalyzer (Hitachi, Japan). Serum high-sensitivity CRP (hs-CRP) was measured using latex-enhanced nephelometry (Behring BN II nephelometer, Germany). As previously described, the values of PAB “as a oxidative stress marker” was measured simultaneously, by photometric method, using 3, 3′, 5, 5′,-tetramethylbenzidine in an ELISA reader at 450 nm with a reference wavelength of 570 or 620 nm, according to the described method by Alamdari et al. The values were expressed in an arbitrary HK units, which show the hydrogen peroxide percentage in the standard solution, and were calculated based on the standard curve. The study was performed according to the Helsinki declaration rules and was approved by the ethics committee of Zahedan University of Medical Sciences. An informed consent was obtained from all subjects participating in the study (Approval date: December 4, 2016; Code No: IR.ZAUMS.REC.1395.224). Statistical analyses were carried out by SPSS statistical software package program (version 18 for Windows, Chicago, IL, USA). The results were expressed as mean ± standard deviation or mean ± standard error of mean in accordance with their distribution. Unpaired t- test or Mann–Whitney U-test was performed for comparison between two groups. Unpaired sample t-test was used to check of homogeneity of age and BMI between groups. Spearman correlation coefficients and multivariable regression analysis were used for assessment of correlation between PAB with other variables. P < 0.05 was considered as statistically significant. The mean age and BMI of the patients (20 men and 20 women) were 55.6 ± 13.4 years and 25.1 ± 4.8 kg/m2, respectively. The mean age and BMI in the healthy controls (23 men and 17 women) were 53 ± 12 years and 25.4 ± 5 kg/m2, respectively. The results showed that these variables did not have different significance (P = 0.18 and 0.79 achieved for age and BMI, respectively). Based on the WC results, of the 40 patients studied, 29 individuals (72.5%), and of the 40 healthy controls, 19 individuals (47.5%) had abdominal obesity (P = 0.02). 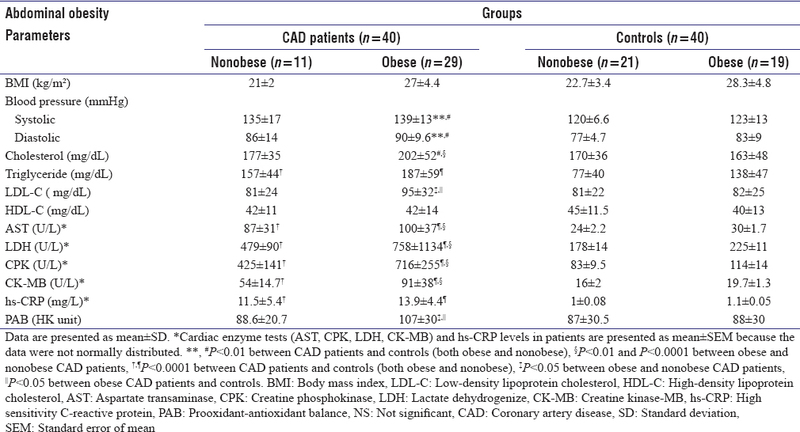 Demographic, clinical, and biochemical characteristics of obese and nonobese CAD patients were represented in [Table 1]. The levels of blood pressure (P < 0.01), triglyceride (P < 0.0001), cardiac enzyme tests (AST, LDH, CPK, and CK-MB), and hs-CRP in both obese and nonobese CAD patients were significantly higher when compared with control group (P < 0.0001). The serum levels of cholesterol were significantly increased in obese CAD patients compared with nonobese patients and obese controls (P < 0.01). The comparison PAB values in CAD patients and controls showed that the values were significantly higher in obese CAD patients than obese controls (P < 0.05). No significantly difference was found between nonobese individuals in CAD patients compared with controls. Overall, a significant positive correlation was found between WC (r = 0.56, P = 0.05), hs-CRP (r = 0.65, P = 0.04), cholesterol (r = 0.36, P = 0.052), and triglyceride (r = 0.29, P = 0.055) with PAB, in CAD patients. The multiple regression analysis showed that a positive correlation was found between WC (β = 0.514, P = 0.04) and CRP with PAB (β = 0.429, P = 0.052) in CAD patients [Table 2]. The studies performed using method of modified PAB assay, as applied in the present study, demonstrated a significant increase of the PAB value in these patients compared to control group., The relationship between CAD and oxidative stress can result from reaction between superoxide radicals and other reactive oxygen species (ROS) with nitric oxide, which is a vital endothelial-derived vasodilator. This reaction may lead to endothelium dysfunction, which is associated with atherosclerosis and cardiovascular diseases. The study demonstrated that in CAD patients, serum levels of hs-CRP, as a systemic inflammatory marker, were markedly higher than controls, and a positive association with PAB and also with several risk factors of CVD including WC, blood pressure, and triglyceride was shown. After adjustment for age and BMI, in multivariate regression analysis, an association between serum CRP and PAB was revealed. The relationship between increased serum levels of CRP with PAB and cardiovascular risk factors, suggesting an vital role of inflammation as predictors of coronary events,, in those who have been diagnosed with history of acute coronary disease, stable angina, and also in apparently healthy individuals. The evidence demonstrate that accumulation of lipids in arteries induces endothelial dysfunction and contributes to oxidized LDL (ox-LDL) and results in the formation of foam cell, thus plays vital role in the atherosclerotic process., An earlier study has indicated that LDL-C concentration can contribute to the lipoproteins oxidation in patients with coronary heart disease (CHD). As well, an increased levels of ox-LDL has been reported in patients with stable CHD, coronary artery stenosis (CAS), and CAD. In our study, ox-LDL was not measured; however, serum levels of triglyceride (in both obese and nonobese patients) and total cholesterol and LDL-C (only in obese patients) were markedly higher compared with healthy controls. As well, a marginal positive correlation between PAB with serum triglyceride and total cholesterol was found in obese-CAD patients, but not in nonobese individuals. There was no significant correlation between LDL-C and HDL-C levels and PAB in both patients and healthy controls. Considering the important role of lipids, as one of the main targets of ROS generation, it is possible that in CAD patients in addition to abdominal obesity, increased levels of LDL-C, total cholesterol and triglyceride “as markers of atherogenic with oxidative stress properties,” and increased levels of serum hs-CRP can be associated with oxidative stress status. However, HDL concentration, as an important index in prevention or decrease of atherosclerosis, which inhibits the LDL oxidation, was no difference between both the patient and control groups. The blood pressure is also one of risk factors contributing to the development of cardiovascular disease, which is associated with oxidative stress. In our study, the mean of blood pressure in the obese CAD patients was significantly higher compared with controls. However, we did not find any correlation between oxidative stress and hypertension in CAD patients, which probably the limited sample size, could explain this fact. It was partly in agreement to a previous study. Further research with larger population is needed to clarify the PAB which is presented as a cardiovascular risk factor. The study shows that the PAB assay in conjunction with other risk factors can be used as an independent prognostic predictor of CAD, particularly in patients who need antioxidant therapy. However, further studies are needed to examine the possible role of PAB as a cardiovascular risk factor. This study was supported by Zahedan University of Medical Sciences. Ebrahimi M, Kazemi-Bajestani SM, Ghayour-Mobarhan M, Ferns GA. Coronary artery disease and its risk factors status in Iran: A review. Iran Red Crescent Med J 2011;13:610-23. Angiolillo DJ, Biasucci LM, Liuzzo G, Crea F. Inflammation in acute coronary syndromes: Mechanisms and clinical implications. Rev Esp Cardiol 2004;57:433-46. Nabatchican F, Einollahi N, Kazemi Khaledi A. Relationship between prooxidant-antioxidant balance and severity of coronary artery disease in patients of Imam Khomeini hospital of Tehran, Iran. Acta Med Iran 2014;52:116-21. Kotur-Stevuljevic J, Memon L, Stefanovic A, Spasic S, Spasojevic-Kalimanovska V, Bogavac-Stanojevic N, et al. Correlation of oxidative stress parameters and inflammatory markers in coronary artery disease patients. Clin Biochem 2007;40:181-7. Biasucci LM. C-reactive protein and secondary prevention of coronary events. Clin Chim Acta 2001;311:49-52. Zebrack JS, Anderson JL, Maycock CA, Horne BD, Bair TL, Muhlestein JB, et al. Usefulness of high-sensitivity C-reactive protein in predicting long-term risk of death or acute myocardial infarction in patients with unstable or stable angina pectoris or acute myocardial infarction. Am J Cardiol 2002;89:145-9. Boskabadi H, Moeini M, Tara F, Tavallaie SH, Saber H, Nejati R, et al. Determination of prooxidant – Antioxidant balance during uncomplicated pregnancy using a rapid assay. J Med Biochem 2013;32:227-32. Matsuda M, Shimomura I. Increased oxidative stress in obesity: Implications for metabolic syndrome, diabetes, hypertension, dyslipidemia, atherosclerosis, and cancer. Obes Res Clin Pract 2013;7:e330-41. Hajjar DP, Gotto AM Jr. Biological relevance of inflammation and oxidative stress in the pathogenesis of arterial diseases. Am J Pathol 2013;182:1474-81. Alamdari DH, Ghayour-Mobarhan M, Tavallaie S, Parizadeh MR, Moohebati M, Ghafoori F, et al. Prooxidant-antioxidant balance as a new risk factor in patients with angiographically defined coronary artery disease. Clin Biochem 2008;41:375-80. Alamdari DH, Ordoudi SA, Nenadis N, Tsimidou MZ, Koliakos G, Parizadeh MR, et al. Comparison of prooxidant-antioxidant balance method with crocin method for determination of total prooxidant-antioxidant capacity. Iran J Basic Med Sci 2009;12:93-9. Karajibani M, Hashemi M, Montazerifar F, Bolouri A, Dikshit M. The status of glutathione peroxidase, superoxide dismutase, Vitamins A, C, E and malondialdehyde in patients with cardiovascular disease in Zahedan, Southeast Iran. J Nutr Sci Vitaminol (Tokyo) 2009;55:309-16. Weinbrenner T, Cladellas M, Isabel Covas M, Fitó M, Tomás M, Sentí M, et al. High oxidative stress in patients with stable coronary heart disease. Atherosclerosis 2003;168:99-106. Montazerifar F, Bolouri A, Paghalea RS, Mahani MK, Karajibani M. Obesity, serum resistin and leptin levels linked to coronary artery disease. Arq Bras Cardiol 2016;107:348-53. Montazerifar F, Karajibani M, Hashemi M, Ardali F, Akrami P, Dashipour AR, et al. Determination of prooxidant and antioxidant blance, clinical parameters and nutrient intakes in hemodialysis patients. World J Nephrol Urol 2015;4:207-12. Stocker R, Keaney JF Jr. Role of oxidative modifications in atherosclerosis. Physiol Rev 2004;84:1381-478. Vassalle C, Boni C, Di Cecco P, Landi P. Elevated hydroperoxide levels as a prognostic predictor of mortality in a cohort of patients with cardiovascular disease. Int J Cardiol 2006;110:415-6. Nojiri S, Daida H, Mokuno H, Iwama Y, Mae K, Ushio F, et al. Association of serum antioxidant capacity with coronary artery disease in middle-aged men. Jpn Heart J 2001;42:677-90. Rahsepar AA, Pourghadamyari H, Moohebati M, Parizadeh SM, Tavallaie S, Paydar R, et al. Prooxidant-anti-oxidant balance is not associated with extent of coronary artery disease. Clin Biochem 2011;44:1304-8. Joshi M, Kotha SR, Malireddy S, Selvaraju V, Satoskar AR, Palesty A, et al. Conundrum of pathogenesis of diabetic cardiomyopathy: Role of vascular endothelial dysfunction, reactive oxygen species, and mitochondria. Mol Cell Biochem 2014;386:233-49. Keaney JF Jr., Larson MG, Vasan RS, Wilson PW, Lipinska I, Corey D, et al. Obesity and systemic oxidative stress: Clinical correlates of oxidative stress in the Framingham Study. Arterioscler Thromb Vasc Biol 2003;23:434-9. Higdon JV, Frei B. Obesity and oxidative stress: A direct link to CVD? Arterioscler Thromb Vasc Biol 2003;23:365-7. Van Gaal LF, Mertens IL, De Block CE. Mechanisms linking obesity with cardiovascular disease. Nature 2006;444:875-80.
de Ferranti S, Rifai N. C-reactive protein and cardiovascular disease: A review of risk prediction and interventions. Clin Chim Acta 2002;317:1-5. Kobylecki CJ, Afzal S, Nordestgaard BG. Genetically low antioxidant protection and risk of cardiovascular disease and heart failure in diabetic subjects. EBioMedicine 2015;2:2010-5. Chen X, Pang S, Lin J, Xia J, Wang Y. Allicin prevents oxidized low-density lipoprotein-induced endothelial cell injury by inhibiting apoptosis and oxidative stress pathway. BMC Complement Altern Med 2016;16:133. Holvoet P, Stassen JM, Van Cleemput J, Collen D, Vanhaecke J. Oxidized low density lipoproteins in patients with transplant-associated coronary artery disease. Arterioscler Thromb Vasc Biol 1998;18:100-7. Holvoet P, Vanhaecke J, Janssens S, Van de Werf F, Collen D. Oxidized LDL and malondialdehyde-modified LDL in patients with acute coronary syndromes and stable coronary artery disease. Circulation 1998;98:1487-94. Karajibani M, Montazerifar F, Hashemi M, Bolouri A, Dikshit M, et al. Study of oxidative stress in patients with angina pectoris admitted to coronary care unit. Zahedan J Res Med Sci 2013;15:20-5.